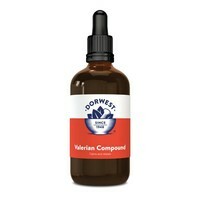 Dorwest Valerian Compound Drops for Dogs and Cats is an easy to give liquid for use with frightened, anxious, hyperactive and stressed animals, to help them calm quickly and safely. Dorwest Valerian Compound can be dropped directly into your pet’s mouth, given on food or even just sprinkled onto a pet’s bedding to result in a more amenable pet. Visits to the vet, travelling or moving to a new house instantly become less stressful. The concentrated herbal extracts used in this liquid ensure that within just 30 minutes a noticeable change in behaviour occurs without causing drowsiness, and the effects are quite short lived. The fast action of Valerian Compound is perfect when faced with unexpected events like Thunderstorms.